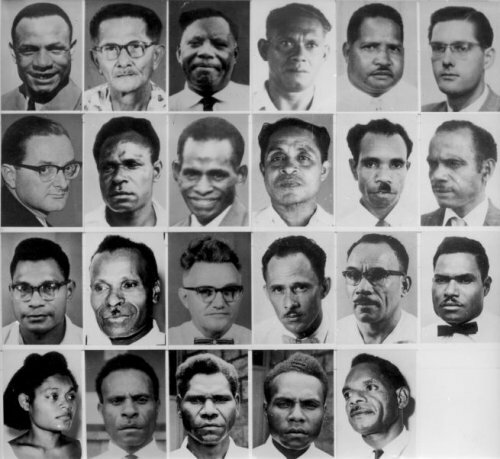 On April 5, 1961, the installation took place from the first (elected) parliament of West Papua: the New Guinea Council. HOLLANDIA – On April 5, 1961 at half past nine in the morning was the big day. The long awaited moment, which by all in the country with so much tension was awaited, had arrived. 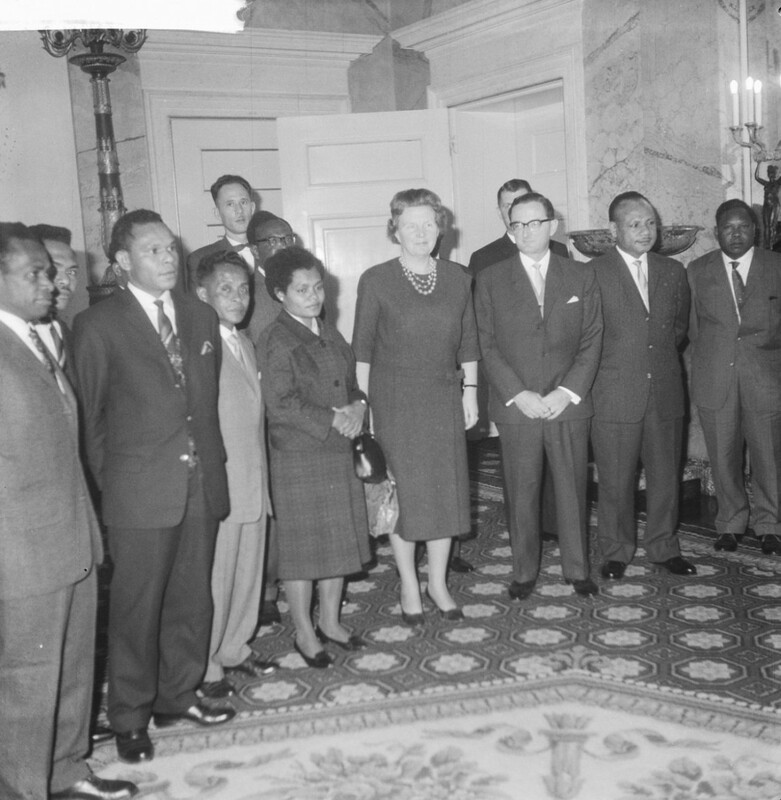 The setting of the New Guinea Council; by the Dutch Government made possible in a far-sighted policy would be a fact. The people of New Guinea came a step closer to her own self-determination; the day that itself will take control of its destiny. The New Guinea Council consists of 29 members who will stand up for the interests of all the people. Among them is one female member, Mrs. Tokoro-Hanasby. In its meetings, the Council will involve ‘s official government policy for New Guinea in its discussions. At eight o’clock the Military Band had already arranged for temporary New Guinea Council building. Her spirited music was something special on that day; it was thereto in accordance with what was alive in the hearts of the many collected spectators. Finally, would it be so far. The enormous preparations that had preceded this day, would get her confiscated. Between eight-thirty and nine o’clock arrived, the guests until the room of the New Guinea Council was filled with guests. Many had arrived in full regalia, which is even more luster to the ceremony continued. The interest from official sources and from abroad was really huge. We saw there the delegation of the Dutch Government, which was led by the Minister of Interior, Mr. Toxopeus, which together with State Secretary Mr. Bot same department already well acquainted with us in connection with the numerous government work they performed for our country. We saw there the delegation of the Dutch parliament under the leadership of Mrs. Stoffels-van Haaften and the delegation of the Australian Government under the leadership of the Minister for Territories Mr. Hasluck. There was the delegation of Australian New Guinea led by the Administrator of Australian New Guinea, Mr. Cleland. There was also the delegation of the Legislative Assembly from Australian New Guinea, represented by Mr Niall as a leader and six indigenous members, including four members came from New Guinea, and two from Papua. Besides the members of the Council of Heads of Service, we saw representatives from the South Pacific region, the South Pacific Commission. It is not practicable to mention every guest by name and title, but it will all be clear that this is happening to our capital unique in its history. At nine o’clock sharp appeared the Governor of Dutch New Guinea, Dr. Platteel. He was met by the Commission of Reception. The Committee comprised Mr Poana, the Rich and Torey. The Governor was invited to participate in a unique place in front of the seats of the New Guinea Council members instead. Mr Chairman and members of the New Guinea Council. In use, however, is said of this claim, it fulfills what the law allows. And now your Council, meeting for the first time, for everybody’s eye came into reality, the significance of that moment is first clearly right. The presence of press, radio, film and television captures you today, not just in front of the people whom you represent, but also to many interested parties throughout the world, your job. The importance of this task is considered so great that a very significant company from near and far come, including members of the Dutch, Australian and New Zealand governments, wanted to attend this solemn event. Not yet strengthened by the power of experience and tradition, you will be for such an important task and entrusted with such great responsibility, I could imagine how pleased we all on this day also, that anxiety, born of a sense of responsibility, your fills hearts. But let me assure you that my pursuit of it will be directed to your Council should the need is felt, do provide all the help and support that he needs. For the welfare of the country is located all, that the Council is well informed and documented can take its decisions. The intention is to, as soon as your schedule allows, with the Council to enter into discussions regarding the establishment of a number of study groups – composed to the Board of example for Adult Education, which is such a valuable piece of work in recent years – each globally as regards a service of general administration, Bamford, for the study of the main problems which arise there. Participation by councilors on each animal groups would create the possibility of providing official and private side opening of business and learning opportunities, which members will better enable them to perform their tasks. As of today is also the Deputy Chairman of the Council of Heads of Service released from the operation of a service and appointed Attorney in the New Guinea Council for General Affairs. This will make it possible to include the largely paying attention to your deliberations and in the short term to meet the need, which will undoubtedly be felt strongly in information and awareness on the part of the Governor. With these examples I hope to assure you that the Government, so far in the privacy of his work performing, fully open to facilitate formal and informal way that the democratic process, which is now in its system inserted to do as well as possible function. The setting of the New Guinea Council is a stop on the way, which leads to self-determination. Wants self-determination is not an empty phrase, it must take root and grow into a powerful national existence where political, economic and cultural development are promoted in a balanced manner. Disruption of this balance would avenge. And where interest today largely concerns the political development of the country, I ask especially your attention to the economic and cultural opportunities, which opened now a parliament was established. The proper execution of these plans requires a great effort of many. In a world full of slogans, it is important with sincerity and realism to tread the path of self-determination. It can be observed that your Council has been established in a truly democratic manner and thus a source for increased effort has been tapped as democratization takes place by switching from free conviction of all available forces. The incentive for the self-activity which gives its meaning to self-determination, should be paid by you. In it I see a very distinguished part of your job. Essentially being regional representatives, you can convey in its own sphere what you have learned to see in contact with each other as important for the whole country. With all the more conviction can stimulate recognition for participation in diligent study and steady work in which the secret of progress and prosperity is located. Conversely, is now central heard your voice, so that’s better insights into the needs and potential of the area you afvaardigde, or for the protection of the interests for which you are appointed. Here you can find support and match what is to come forward in the local communities. When the great perceptiveness which were the activities for the establishment of the New Guinea Council, it is temporal spring well that this year five new regional community councils into force will come and also for the year 1962 in the draft budget still three is counted, regardless of the two urban communities. Now soon the Dutch Government Officer in the Assistance Corps will be accommodated is thus cleared the way for accelerated integration of the Papuans, because it becomes possible to do this at any time take the place for which his training and capabilities make it suitable. Netherlands’s character as a contribution steunverlenend country is thus evident. Now, in addition, the treatment of public affairs into the open thine Council meeting will take place, all the conditions are in place to protect the hitherto so open and good relationship between Dutch and Papuan permanent. In such an atmosphere the Dutch intervention can equally be heartily accepted, if it is given for the salvation of New Guinea. From this perspective, the political development where this day of testimony, not keep formal or theoretical, but most everyday life now and influence thoroughly in the distant future. The signs are very favorable, because who on of some fantasies about leaving New Guinea would think when he comes here to enter a country full of turmoil, tension and strife, soon discovered that the opposite is true. Even the election of the New Guinea Council, which tempers have severely agitated, have been a picture of disunity, but rather of harmony. The election battle in which we saw that Papuans Dutch and Dutch supported Papuan candidacy is a fight that essentially indicated a prevailing harmony that can save this country of contradictions that play a harmful role in many parts of the world. On the race is not given, only confidence and ability. The collaboration of the voters will continue in collaboration within your Board and in cooperation between the Council and Government executive bodies. Small countries can be significant. Dutch New Guinea is a small country, but it may set a great example. May God grant you the wisdom to make it useful to the Council’s work. He bless your deliberations. With these words, Mr President and members of the New Guinea Council, I use the privilege to declare the first session open. Members of the New Guinea Council. I wish you much happiness and satisfaction increased in all your work for your country and people. In the Netherlands, there is joy, that ye present your work begins. It is the first step on the road that leads to the exercise of the right to self-determination through your people. May that way turn out to be short. Be yourself. Remains yourself, in the form that you will choose yourself, such as your own nature, you will enter. Netherlands feels, as you know, in friendship and bound in good conscience, you enable and provide the guarantees, freely to decide your own fate. After all, this is our only goal. For to every person and every nation is the right to freedom and independence, and all they have allowed to exercise this right, if they wish. The job of your counsel’s it, now make the decision at hand. Netherlands want your people as soon as possible to see a dignified and equal station to take in the community of the modern world and to the forum of the United Nations. Netherlands also follows with sympathy the similar trend as in You, which took place in the eastern half of your big island. My best wishes accompany you in your responsible work and your great task now and for the future. At the suggestion of the president of the New Guinea Council, Her Majesty was then decided to send the following telegram to convey the thanks for her speech. “On behalf of the members of the New Guinea Council is to be able to give me a privilege to express our sincere joy at your Majesty’s striking and encouraging words, uttered in the Royal Address, it just us, gathered in solemn opening ceremony, performed was brought. Your Majesty yellowing unne me, thanks for Her congratulations accompanied to give up the expression of deep affection for Your Home and feelings of strong solidarity with the Dutch people. Then they started the actual session of the New Guinea Council and the two Vice-Chairmen of the Board were elected. Mr. Kaisiëpo was First Vice President and Mr. Jouwe second vice voorzltter. This two Vice-Presidents were invited to sit on both sides of the chairman of the NGR. After that was read a telegram which was sent by the Governor of Suriname. Also this telegram was answered by members of the NGR thanks for the congratulations. Then successively took the floor Mr. Sollewijn Gelpke, president NGR, Minister Toxopeus, Minister Bot, Mrs. Stoffels-van Haaften as leader of the delegation, Mr. Boendermaker, Mr. Cleland, Mr. Niall as leader of the delegation Legislative Council from TPNG, and then the members of the New Guinea Council, Messrs Jouwe, The Rich, and Poana Womsiwor. The most notable of these speeches was that all sides support and cooperation towards the New Guinea Council was promised. However, the speakers are not hidden their expectations and hopes for an independent country and people of New Guinea.